I talked last week about increasing fuel economy standards in the US and how our engine designs have been improving incrementally to meet this new demand. It was almost a year ago that I talked about the military’s affection for diesel in a wide variety of platforms. Well now it seems like the flexibility of diesel and the American consumer’s desire for better fuel efficiency is meeting somewhere in the middle. When Americans think about diesel they might have an image in their heads of 1970s diesel cars puffing black smoke everywhere or a smelly large truck. Diesel is extremely popular in Europe but their environmental and safety standards are different which prevented direct injection (ha!) 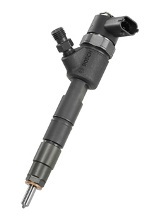 of European diesel cars in to the US (like the direct injection of the Bosch common rail injector in the photo). Still the advantages in fuel economy with the models we’ve been seeing so far have been impressive. A regular, standard model Jetta has 115HP and gets about 24/34 mpg. A Jetta TDI (turbocharged direct inject) diesel gets about 30/42 mpg with a turbocharged 140HP engine. But you need that savings in fuel economy since Jetta TDIs go for about $6,000 more than the base model Jetta or about a 36% price markup. Not to mention diesel hovers at about 15% more than unleaded gas in the US. Part of this is because most unleaded gas contains some amount of ethanol which is heavily subsidized. Europe and India provide diesel subsidies for exactly the same reasons: to encourage drivers towards the diesel fuel using and more economical engines. It’s difficult to think of Americans really embracing diesel technology in the same way the Europeans have. But earlier this year, Chevrolet announced it will be introducing a diesel version of the Cruze rumored to get up to 50 mpg. With consumers expecting more power from their engines, and more money left over in their wallets, turbocharged diesel engines might just be an important part of that big picture. Like I spoke about last week, it will likely take a variety of different kinds of solutions, traditional gasoline engines, hybrids and even electric cars for manufacturers to meet their goals. I think it’s pretty clear now that diesel will be one of the many solutions available as well. Have you ever considered purchasing a diesel car for your garage? I do own a diesel pickup and I am currently a diesel mechanic. This is the reason this post stuck out at me. I am currently in what seems to be an eventual dead end job if I stay where I am at. It does seem to me that diesel could be a big part of the future in efficiency and in emission problems. The emission controls they are creating for diesels are amazing compared to the black cloud of older diesel engines. from Diesel Particulate filters to the most recent Urea tanks diesel particulates have been greatly reduced. Were I’m sitting right now I want to be a part of all this new technology and I currently have an associates degree and thinking about going into engineering but I am still not completely aware of what its all about. Any tips or hints would be helpful.